(26/12/2017, 16:14)Michael Wrote: Is the 685 even running today?, its Boxing day. Stagecoach are running it as far as Brampton before it turns around to go back to Carlisle. 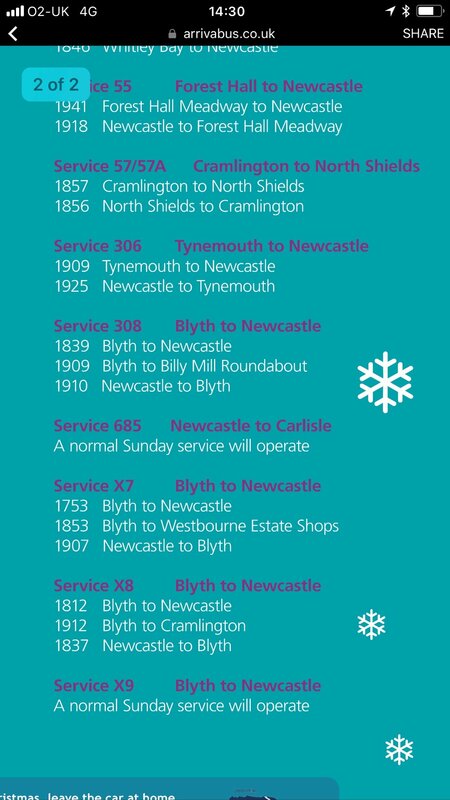 That's on the page for Christmas Eve and New Year's Eve services, Boxing Day services are on the first page with timetables for each service that is running. Just paid £1.20 for a metro ticket, the machine said transaction cancelled and didn’t spit my money back out.... fantastic..
Left my phone at my flat when I went to MetroCentre to get some photos of Rail Replacements as well as I wanted one of GNE 3983 (which didn’t run on the X50 again this week annoyingly). So had to go all the way back for it to Hexham to get it as I am staying away from there till Monday, luckily had my camera in my bag for the buses. In the past, I have said some things in this thread that may come across in a bad light, looking back, some of the things that I have said has appeared to ruffle some feathers and I am sorry for some of the comments that I have made, a fair number of the posts have made at times when I have been feeling angry or in some cases some distress and as a result I haven't really stopped to think about what I am posting and after posting I often regret what I have said but unfortunately I've passed the point of no return, especially if someone replies to my posts as otherwise I could quietly delete the comments and hope nobody notices. If I have upset anyone with any of my outbursts, than I can only apologise, there's a few instances where I would like to put things right but I don't think I am going to be able to. I have screwed up, sorry. That post has been made as a result of one instance in particular where I expressed some criticism which has clearly caused some upset, that said however, I think the comments were taken a bit too much to heart, nearly two years on and clearly there is still a grudge. Neighbour in flat above mine being an idiot last night banging on their floor after 11pm sounding rather annoyed, had my other half there and we were talking at a normal level. Then this morning when about to go out can here them saying stuff at a loud volume. Gone to my mams for a couple of nights but gonna go to Karbon Homes next time I’m in Hexham to put in a complaint about them. This isn’t the first time as back in October they were banging repeatedly and shouting profanities for no reason and I complained then but then I went back to my mams for about a week. Seems to happen when I have visitors. I am planning on moving as sick of it as well as keeping me awake when trying to sleep as they talk in their sleep as well non stop. Sad pathetic little bus enthusiasts are adding and discussing members of my family in Messenger group chats which has sod all to do with them. I honestly don't know what to do. Help?! Feel completely powerless to stop it as well and can't bring myself to tell the family about it. Name and shame them on here. Its pathetic, and it should be called out. No clue who half of these people are and some are using fake profiles. 3983 off the road at the moment! And that's just the kids, ime. Wore my new boots around town whilst unusually taking pictures in broad daylight. My lace caught on something, it ripped itself causing me to trip and then breaking the lens of my camera on impact. I'm also suffering bad wrist pains so who knows..
Around 300£s worth of damage..
(29/03/2018, 00:31)BusLoverMum Wrote: Bloody expensive boots!